Can you provide us with a few more details? When you say the client opens the image in Evernote: Do you mean they open the note? Import the image to Evernote? Are they doing this in the iPad version of Evernote only, or do they also try in a desktop version? 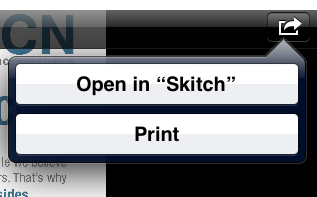 Currently the only version of Evernote that has a "Open in Skitch" option is the Windows Desktop version. All others rely on the underlying operating system to pass over and share data. We register our iOS apps as an app that can handle photos or images, but that requires other apps to respect that setting and present us as an option when the user tries to use the "Open with" command. I have images in Evernote that I need to view and markup with Skitch. Images have been added to Evernote with the Mac desktop version, and I am viewing and marking them up with Evernote/Skitch iPad version. However, some images have the option to "open with Skitch" (see image attached called Option1), which is exactly what I want. 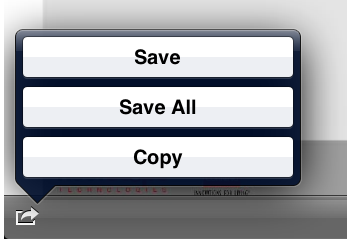 But other images, only have the option to save the image to the gallery/camera roll (see image attached called Option2). All images are .jpgs and are roughly all the same size. I can't quite figure out why some images dont have the option to "open with Skitch" and others do not, and how to get the "open with Skitch" to show up every time. I thought I had it figured out, that is was something to do with the way the images were being added to the note in the desktop version, but that has since proved not the case. Thanks for the information. I'll pass along this info to our Evernote iOS team. What's happening is: In order for Skitch to be a destination for images on iOS (a receiver for "Open with" for jpgs) and while we have done that, it requires iOS to respect that option for every image. Generally this works every time, but there are occasions when iOS isn't sure what to do, and you can't "Open with" a certain file. It's possible there is an issue with Evernote and the image, so we'll have that investigated. Continue trying the "Open with" and see if it works (though appears sometimes it doesn't work for you). Since you are using a Mac, you can easily drag and drop the images into the Skitch library on the Mac and they will be turned into Notes in your Evernote account, and then when you access Skitch for iPad they will show up there automatically. Save the images to your Photo Roll on iOS and then import them to Skitch (as you are doing already). We are working on tighter integration between Skitch and Evernote, and hope to have that functionality in the future. I don't know if it's any help to you in fixing the issue, but in my trying to figure out why some work and some don't I found that I have more luck getting them to work when the note is created by dragging and dropping the image in to the notebook (desktop version) versus creating the note with the "new note in..." button.